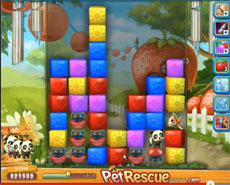 In pet rescue level 341 you have to be patient in order to complete the level. Countless half column blasters fall above the screen. You have to use them in order to smash the glass around the keys from the first stage of the level (the keys will be used later, when needed to). After that the level goes one as you clear the blocks. Our strategy was to use the column blasters when we hadn’t any other moves to do. This thing is a little dangerous because you can stay out of moves, but if you don’t, you have some boosters to help you in the final phase of the level. There, you have to foresee the next combination of blocks (as we do after the 5 min of the following video),when to use the column blasters, in order to rescue the demanded number of pets. Are you trying unsuccessfully to pass pet rescue level 341? The following video will show you how to do it, without using any boosters. Beware! 4 of the 7 pets are in the column on the right, You can release 2 of them with the horizontal line blasters, so try to keep 1 or 2 down facing blasters for the other 2.
cool tip Danny! Thanks for sharing! Thanks guys! Once again this site saves my bacon!